Reinforced concrete pipes are used extensively in storm water and sewage applications. In North America, these pipes are often designed using the “Indirect Design Method”, which relates the strength of a pipe tested above ground to one buried in the ground. The soil surrounding a buried pipe increases the load carrying capacity compared to an identical pipe tested without soil support. 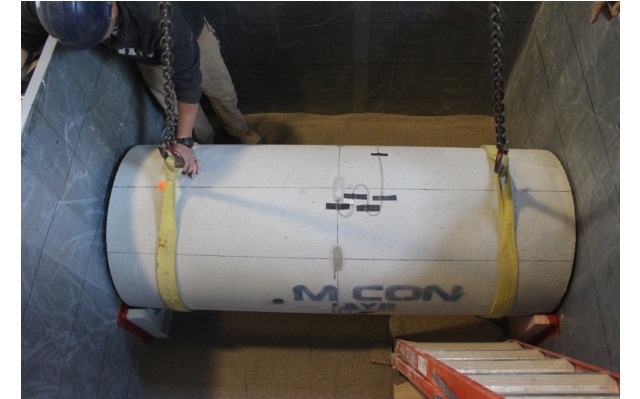 Reinforced concrete pipes are normally tested using a three edge bearing test and the critical load for design is the applied load required to create a 0.254 mm (0.01 in.) crack in the pipe, since it is believed that wider cracks will lead to premature deterioration as water is allowed to reach the reinforcement and induce corrosion. The Indirect Design Method relates the three edge bearing test load to the buried pipe behavior through a bedding factor, which is essentially the ratio of the buried pipe capacity to the three edge bearing test load. The bedding factors were established by comparing the results of three edge bearing tests to the capacity of buried pipes determined using numerical simulations. There has been very little work done to investigate whether the bedding factors produce accurate estimates of the load required to produce cracking in buried reinforced concrete pipes. In light of this background, an experimental campaign was undertaken at Queen’s University with the support of the National Cooperative Highway Research Program (NCHRP) through the Transportation Research Board of the National Academy of Sciences, Washington D.C.
A series of tests were undertaken at the Buried Infrastructure Laboratory at Queen’s University using both the 7.6 m (25 ft) by 7.6 m (25 ft) by 3 m (9.8 ft) deep test pit, and the biaxial cell for deep burial simulations. To investigate the behavior of shallow buried pipes, two 0.6 m (24 in.) diameter pipes using two different amounts of reinforcement and two 1.2 m (48 in.) diameter pipes with two wall thicknesses were tested under surface loading at three different burial depths. Additionally, a 0.6 m (24 in.) pipe was tested under simulated deep burial. Under shallow burial and service live loading, no visible cracks developed at any locations in the four specimens. At 0.3 m (1 ft) of cover and under single wheel pad loading, the 0.6 m (24 in.) pipes developed the service limit crack width of 0.25 mm (0.01 in.) at 3 to 4 times the design service load, and the 1.2 m (48 in.) pipes developed the critical crack at between 2.5 to 3.0 times the design service load. It was found that the 0.6 m (24 in.) pipes had bedding factors of 1.17 and 1.68 times the design bedding factor specified by AASHTO, while the 1.2 m (48 in.) had bedding factors of 1.17 and 1.75 times the design live load bedding factor. These values are conservative although it is worth noting that earlier versions of the AASHTO code provided much more conservative values. Under simulated deep burial, the ratio of experimental earth load bedding factor to design bedding factor was 1.77, again suggesting that the Indirect Design method may lead to conservative values for the pipe capacity.